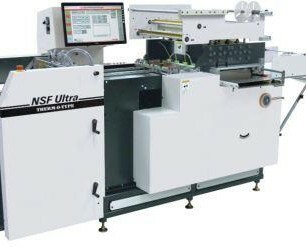 NSF Ultra applications include greeting cards, business cards, stationery, pocket/presentation folders, packaging, invitations and announcements, commercial letterpress work as well as die cutting and enhancing/finishing digital output. Contact us for more information on this THERM-O-TYPE NSF Die Cutter & Foil Stamping Press, by clicking the blue “get more info” button to the right. Or, view more information in the product brochure below.